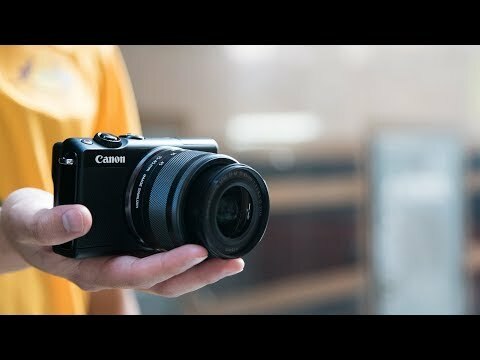 The Canon EOS M100 is jam packed with features that make it easy and fun to capture special moments that can be shared with your friends, family and followers. With a super-lightweight and compact design the camera can be customised with an optional camera body jacket that comes in a choice of 9 colours. The camera has a 24.2-megapixel image sensor that captures high resolution images with spectacular colours and incredibly sharp image detail. The large APS-C image sensor is more than 10 times bigger than the average mobile sensor to take better shots at dusk or night-time when there is less available light. An advanced DIGIC 7 image processor makes the camera capable of an impressive 100-25600 ISO range which can make the sensor more sensitive to light without reducing image quality. The processor also makes fast calculations so you can capture 4 shots a second with focus tracking or 6.1 shots a second with locked autofocus. Canon’s dual pixel CMOS autofocus technology provides super-quick focusing to ensure your shots are always sharp and in focus. Accurate dual pixel AF works in both the stills and video modes and when combined the camera has a face tracking priority feature to ensure picture perfect portraits. Put yourself in the picture and capture your best side with the M100’s 3-inch touch sensitive LCD screen that flips 180° perfect for selfies and group photos. The camera has a background defocus setting that lets you control how blurry the background is as well as a smooth skin effect. Perfect for vloggers and travel videographers, the camera records Full High Definition video with a 1080p resolution and can record slow motion at 60 fps to capture fast moving moments. The time-lapse movie mode captures a series of images that are processed into a movie that compresses hours into seconds. Travel vloggers will find time-lapses ideal for sunsets, sunrises, and other transition shots. A constant Bluetooth connection means you can send shots to your mobile device without turning the camera on or taking it out of your bag, so you can share the moments that matter to the people you care about quickly and easily. Connecting is simple with the built-in NFC and you can take better group selfies by remotely controlling and triggering your camera from your phone. Creative possibilities are endless with the interchangeable lens design of the M100 because it is compatible with the entire Canon EF-M series of lenses and with the optional adaptor the camera you can even shoot with Canon’s EF and EF-S lenses. 7.5 cm (3.0”) ClearView II Touchscreen LCD (TFT). 3:2 aspect ratio. Approx. 1,040,000 dots. Electrostatic capacitive type. Tiltable 180 degrees up.